We can all look fondly back on 2018 as a year that gave us some truly fantastic games, sequels, and announcements. We didn’t particularly have high hopes going into 2018 after the stellar year 2017 was for the games industry, but we were pleasantly surprised by the surprises around every corner. That being said, it clearly can’t be a year of only great and wondrous events. Scandals, loot boxes, microtransactions, and failed promises crept across our news feed right alongside the groundbreaking news and events we remember so happily. 2018 wasn’t a bad year, but it sure wasn’t great. 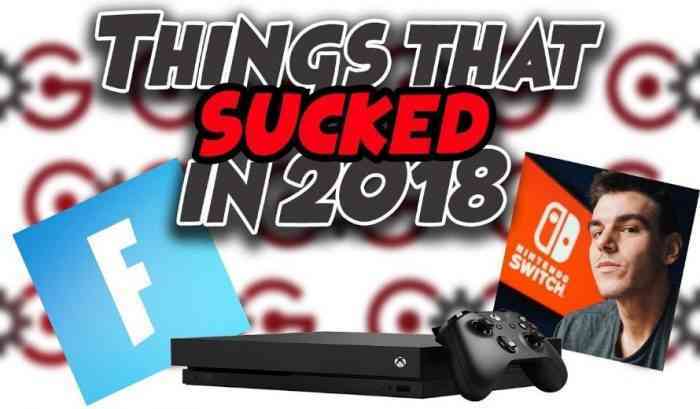 With that in mind, here are 10 things that sucked in gaming in 2018, and hopefully the industry has all learned, taken the winter break to relax and come back fresh for a spectacular 2019. Enjoy. So there you have it, some of the less than wonderful things that happened to the industry and gaming in 2018. With the plagarism controversy and complete disappearance of the PlayStation Experience, what was the biggest blunder for you in 2018? Was there something we missed? Do you disagree with the pointlessness of emotes in games? What is your take on the battle royale craze as a whole? Let us know your thoughts on Facebook, Twitter, or the Comments section below, and be sure to stick around as bring you all of your gaming news, reviews, features and more through-out 2019.